We have industrial strength communications at affordable rates. Licensed communications specialist with over 20 years experience offering customized communications systems for your special event. Discover the difference of working with people who love this stuff! 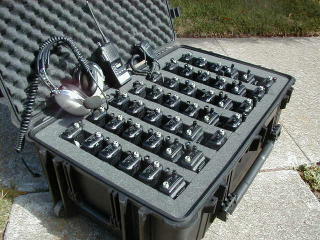 Lightweight, full-power hand held radios with audio accessories included free. Complete temporary systems available for on-site installation. Customized solutions delivered with professionalism and pride by a locally-owned, independent, family business. Let us know what you need and we'll create a system that will work for you. Two-way radio communications are a vital element to any team effort. Cell phones are generally only good for one-to-one contact, but two-ways empower every member to be on the same page at the same time. Why make a handful of phone calls trying to find out who can fill your request when one radio call can get you the answers you need with radio speed. Rugby tournaments, Auto racing teams, Trade shows, Film festivals, Robotics competitions, Safety monitors at demonstration marches are all examples of groups we have provided with communications systems for success. Special requests and consultation offered with over 15 years of event and incident management communications experience. Give us a call and see what we can do for your team. We love seeing this stuff work and you'll love seeing what a difference good radios can make. OPG Communications is a local, independent, family business owned and operated by Desmond Crisis. We are passionate about communications and the success of our clients. Desmond began playing with radios at a very young age and has a lifetime of experience in all forms of wireless technology. This experience and perspective made him a fixture on the early days of Tech Media as a correspodent and host of CNET's broadcast television and radio networks. Few things are more gratifying to a dedicated technology enthusiast than seeing technology do a great job. Without a mission, tech is only as satisfying as any other hobby. Organizations experiencing success and working together as a team facilitated by a good radio communications network is the reward of our expertise. We prefer to keep things simple. Our costs are kept low by providing radios that have been repurposed and refurbished. Repairs and calibrations are handled at our own facility regularly. Our experience with all major radio manufacturers and our own in-house testing proves that our Icom and Vertex radios perform just as well as more expensive radios. These radios were carefully chosen as the most reliable, best performing models with the widest range of accessory options available. Our fleet of rental radios are generally made up of the following equipment. 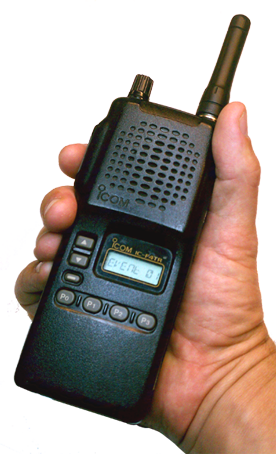 We use the Icom IC-F4 and F4TR UHF Handheld radios. 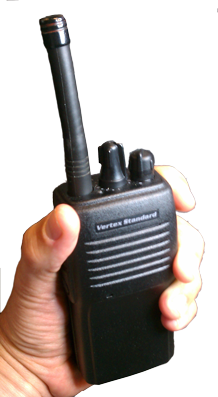 We also feature the Vertex-Standard VX-160U Uhf handheld radio. These are a compact, yet full-power portable. VX-160's are very lightweight and also conceal well under shirts and jackets for discreet functions. All chargers and necessary spare batteries are provided at no extra charge. We also offer audio accessories to tailor the system to your needs. We also offer audio accessories to tailor the system to your individual needs. These are the remote units that extend the microphone, speaker and Push-to-Talk (or "PTT") switch to a more convenient location with a clip. This frees the user from having to remove the radio from a belt or other locaton in order to operate it. 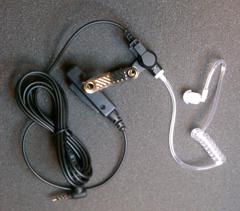 These perform a similar function to the Speaker Mike, but are worn on the head with a small speaker near one ear, the microphone is held in front of the mouth by a flexible boom. The PTT switch is along the wire to the radio and may be clipped to a convenient location on the user's clothing. For louder work environments, we also have aviation-style helicopter headsets with connectors for our radios. This is the industry standard description of an earphone worn in the ear at the end of a clear, coiled acoustic tube. (These are very similar to what Secret Service or other plainclothes operators are seen wearing. "Agent Smith" from the movie, "The Matrix" is an ideal reference.) 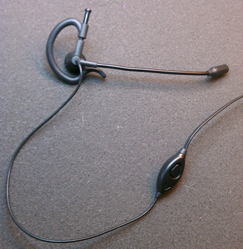 The tube is clipped to the back of the user's collar with a wire leading to the microphone. 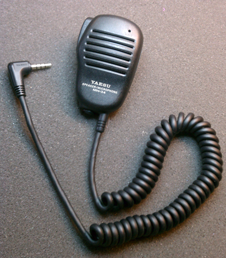 The microphone with integrated PTT is clipped to a convenient location on the user's clothing with a wire leading to the radio. 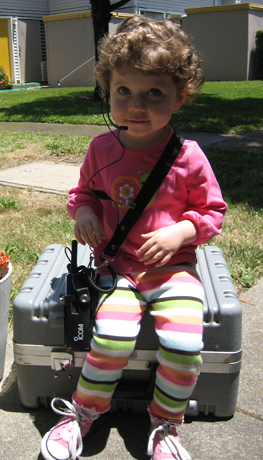 Our surveillance kits are referred to as the "Two-Wire" style because the PTT is part of the microphone module. Similar to the lightweight headsets, these easy-to-wear earpieces are worn over the top of the ear with the earphone just outside the ear. The microphone is part of the PTT switch built into the single wire to the radio. 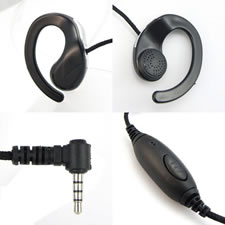 Some users prefer this type of accessory as the earphone is just outside the ear rather than inside like a surveillance kit. OPG Communications also provides a wide variety of consulting services. We're always happy to give you a rental quote, or answer your questions about your radio and communications system needs. Or give us a phone call at (415) 547-0044 during regular business hours. The answers you need at radio speed.